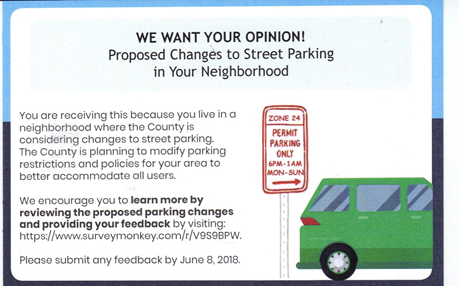 Please remember to take the time to provide feedback on the County’s proposed expansion of the Residential Parking Permit program to most households in Arlington Mill and Forest Glen before June 8, 2018. The survey is available online and contains three possible parking scenarios. The County wants to know how each of the three would impact each of us and if we would chose to participate (if our current zoning was repealed). 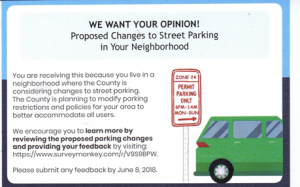 Please think carefully about the questions and envision how the addition of most houses within the Civic Association would affect the supply of street parking on S Arlington Mill Drive.